On Tuesdays our local fire department gives tours of the fire station to kids. My friend, Julia, set up a tour for a group of us to go look at everything. Carson was beyond excited. 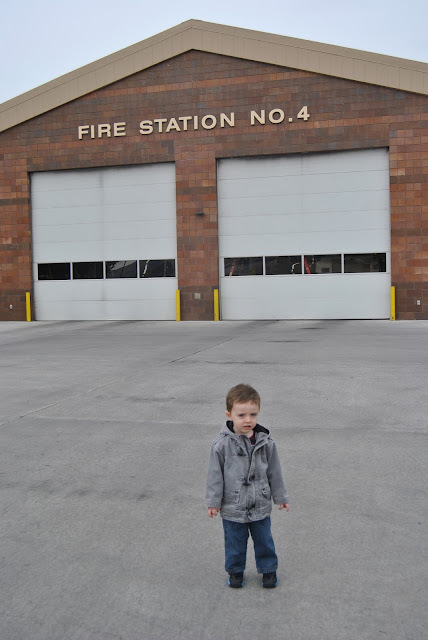 He loves firetrucks and was really excited to see them. Carson just climbed in his lap while he was talking to the kids about fire safety. He had such a blast! He got to climb in the fire truck and the ambulance and look around. He explored everything he possibly could. He wasn't ready to leave when it was time to go! Hopefully we can go again in a few months so he can see everything again. I want him to be familiar with firefighters and police officers so that he will know they are there to help him if he ever needs it. I think today was a great start!